#ROHcosi 1st Cosi for me. Music and singing were very good.Production interesting but could have shed one layer of complexity.Am going back. #ROHCosi production was too like being read a sociology textbook. Sometimes clever & funny, sometimes not. Six great performances though. The best of #ROHcosi comes from the pit. On stage sets are lovely to look at but it is like view from a train, no emotional engagement. After such a remarkably intelligent opening scene, making the very intentional blur between stage and reality a central theme in the production, I was a bit disappointed; while interesting and certainly imaginative, I found the production too fragmented and sometimes lacking cohesion, needlessly jumping from one scene to the next one. Quite impressed with the singing, a great first night for new performers. Charmless. No emotional engagement. No redeeming features. Result, a thing of beauty has been destroyed in order to satisfy direct/set designers ego. Read backtrack.com review before going/booking. Couldn't agree more. I took my son and daughter in law telling them how charming and funny an evening they were going to have. The production was horrible and very confusing. It completely ruined the evening even though the singing was good. It is going to take a long time and persuasion to get them to come and see it again. What a pity, and so unnecessary. Why mess with what is already wonderful (I particularly liked the production where the boys return as bikers, covered in tattoos). A breathtaking ;Un aura amorosa' from Daniel Behle - otherwise I found it a mess. So sad. By all means read the Bachtrack review in splendid isolation if all you seek is to have your prejudices about witty and intelligent theatrical interpretations that dare to deviate from the straight and narrow confirmed. This production is brightly sung and cleverly and engagingly staged, and as good theatre should, it asks questions of us, and prompts us to ask questions of ourselves. The cast are excellent, Daniel Behle especially standing out, and the voices work wonderfully well together. I had to leave Saturday evening's performance 30 minutes from the end to get the last train home to Leicester at 22.25, which I'm gutted about, annoyed that East Midlands Trains don't run as late on Saturdays as they do weekdays (23.15), and peeved with ROH that they didn't start earlier. Still, I'll be going along to see the live screening and the encore showing. A terrific, witty, bright and intelligent Cosi, but a little more clip from the pit might have helped move things along, but what great singing! A wasted and interminable evening. It was never clear who these people were. I felt no emotional connection with any of them. The presence of supernumeraries was a constant distraction and prevented emotional connection. The inconsistent costumes of the Albanians prevented emotional connection. The constant artifice prevented emotional connection. The lack of emotional connection made the whole evening pointless. The disguise being seen through early on rendered the “discovery” in the last scene meaningless. I have never known Despina's disguises to be so unfunny. Charm, wit and subtlety, all were absent. I did not think it possible to be so bored by a Mozart opera. And the production committed the cardinal error of having a vast open stage at the back in many scenes, with a restricted false proscenium in front, preventing much of the sound from the singers reaching the auditorium. This affected the chorus particularly badly. An unnecessarily long evening, indeed, though there were commendable things about it. I enjoyed the general concept of the production. It was clever and this isn't an easy opera to stage because of the pretense from all sides. On the other hand I was distracted by all the business going on during the overture, which is one of Mozart's best, and I was trying to focus on the orchestra. Also the Personnenregie needed a lot more work, especially on the ladies' side. Singing-wise, the highlight of the evening was hands down Un'aura amorosa, with which I see a lot of people agree. Behle is an exciting singer, I will make time for him again. Bychkov's tempi were exasperating throughout the evening and his conducting lacked playfulness. There is so much wrong with this disastrous production, it is hard to know where to start - I do wonder if the Director actually read the libretto. When the Overture started I thought it was going to be a good production with no action to distract us from Mozart's beautiful music - how wrong was I. I am not sure what all that parading about was supposed to mean. Then the opening scene - why play the first part in the auditorium? Why were the 2 girls there? Not needed at that point. Scene 2 - why were we all transported onto the set of Brief Encounter. Scene 3 should take place in Fiordiligi's and Dorabella's House with Despina serving chocolate so why were we in a cocktail bar. Fiordiligi actually says "Why are you allowing men in our house". 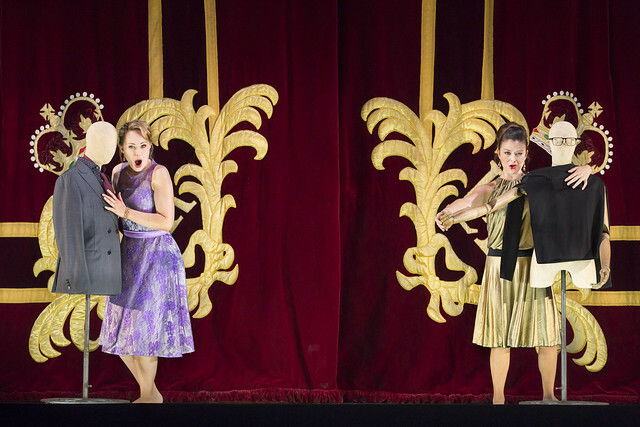 In Act 2 during the gorgeous duet for Dorabella and Gugliemo, Dorabella strips off his false moustache. How did she know it was a false moustache? When she had stripped it off she would surely have recognised and realised he was Gugliemo so that is the end of the plot. Call me old fashioned but I would have thought that Lorenzo Da Ponte and Mozart created a work of genius so why does anyone think they can improve it with a string of gimmicks? The less said about the musical side the better. And I had the temerity to criticise Jonathan Miler's production. But of course when Fiordiligi says says "Why are you allowing men in our house", that was carefully omitted from the surtitles. After finding myself at some awful ROH productions I resolved never to go again before learning all I could about the production.. This works very well. While I love the opera 'Cosi fan Tutte', this staging is not for me. 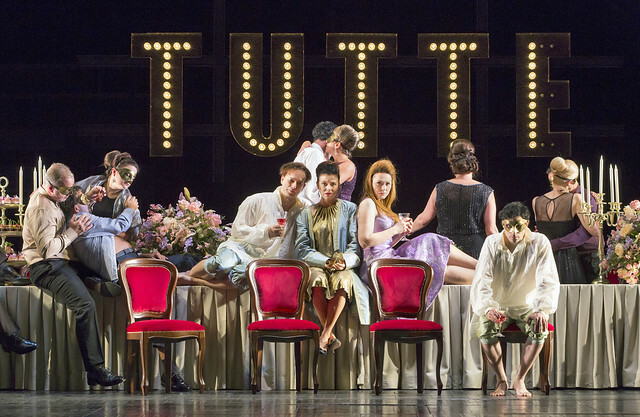 Tonight 29/09/16 Cosi Fan Tutte. Congratulations to all the cast for a wonderful evening's performance and entertainment. I have struggled to find a kind word for many recent opera productions at the ROH but I thought that this young cast deserve the highest praise as they embraced the production to full effect. I am a traditionalist at heart but I thought the stage sets were inspired and very artistically creative. The singing was superb and the orchestra and conductor in fine form. A wonderful night! LIke Peter Stephen, I am a traditionalist at heart but this production worked for me, very clever and imaginative. impressive Johannes Martin Kraenzle as Don Alfonso made for a very enjoyable evening. I have seen the last four revivals of Cosi at Covent Garden and this was definitely the weakest of the all. Firstly I think it was a real shame to replace the brilliant Jonathan Miller production that still looked fresh and raised many laughs for a production that looks elegant but is intellectually incoherent. The opera is built on an absurd premise - the woman not realising they're being duped - but then setting the whole thing in a theatre (and the women somehow not realising this) simply pushed the whole thing too far for me - the suspension of disbelief collapsed. Moreover, I just didn't think the show was funny. Musically, this was very disappointing. Bychhkov's conducting lacked energy and wit, and some of the singing was really subpar; the Fiordiligi in particularly had ongoing intonation problems on Friday evening and some really squally high singing that were quite uncomfortable to listen to. Perhaps it was necessary to cast this on a budget but I really think it should have been possible to find more more high-class singers than this. The singing and the orchestral playing were splendid. Corinne Winters and Daniel Behle were outstanding. I read the programme notes in advance, but the producer seemed not to understand the work. Of course the sisters do not recognise their suitors - that's the whole point. (Nor does Despina, who is pretty bright). Cosi can be really moving if it is well done but this fine musical performance was sabotaged by the production. The business during the overture was pointless and distracting. I didn't like Jonathan Miller's production but the two productions before that worked well. I recommend that Mr Gloger read the libretto, and the relevant chapter in William Mann's "The Operas of Mozart" and listen to the music! We thoroughly enjoyed this. It was absolutely beautifully sung - the whole cast were outstanding. Corinne Winters was a captivating and passionate Fiordiligi, with such presence and a rich, vibrant soprano. 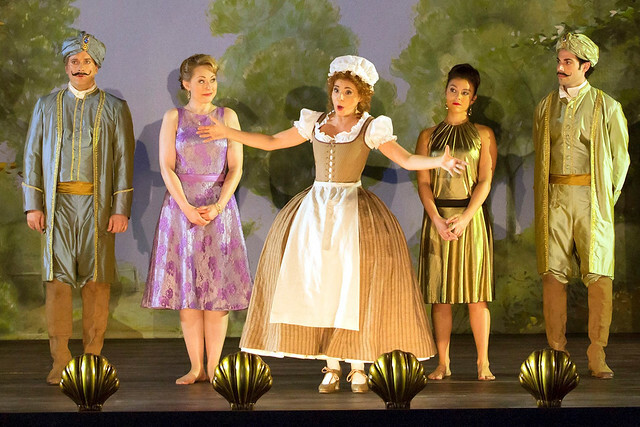 Angela Brower complemented her perfectly as a cheeky Dorabella, with voice to match. Allesio Arduini was an engaging Guglielmo, and Daniel Behle gave a dexterous performance as Ferrando, and interesting choices in Un Aura Amorosa, singing it with a rare delicacy. Johannes Martin Kränzle and Sabina Puértolas were a madly funny double act as Don Alfonso and Despina. It was clear that much work had been achieved in getting all the vocalists blending harmoniously and indeed the same could be said for Seymon Bychkov who equally produced such a harmonious performance from the orchestra. The performance was entirely captivating and the direction under Jan Philipp Gloger was imaginative, witty and nuanced. The only aspect I felt was not quite as fine as the rest of this wonderful interpretation was the end, in which I wasn't quite convinced of the ironic interpretation of the finale - an interesting choice, but somehow it felt once step too far and not quite as justified as the rest, the continued discomfort and confusion of the protagonists at odds with the harmonious resolve in Mozart's score, and like they hadn't actually learned anything from the machinations. It seemed an oddly downbeat, and somewhat over-cynical end for what is, after all, opera buffa. All in all, though, I would highly recommend this in every way. Thank goodness - a fresh Cosi. Right from the start it was different - loved the overture with all its humour. I was at it live-streamed in Cork Ireland & I felt almost back in London (where I lived through many Cosis). Delightful singing, choreography & chorus. Loved the difficult mixed feelings at the end - that's a big challenge & an opportunity to help people see this opera is still relevant to us today. Overall - deserves congratulations all round. verfremdungseffekt doesn't improve an opera. It may have worked back in the day for Brecht but Cosi doesn't need it and it makes the whole thing look like austerity cuts have reached the Royal Opera. Johan Kränzle and Sabina Puértolas really stood out and had a nice spark going between them. Angela Brower also acted well. The whole thing lacked tempo, spark, wit. The way this was performed nothing really stood out. Poor production, waste of my cinema ticket. What a wonderful production, I thoroughly enjoyed this innovative and charming take on a classic. Johannes Martin Kränzle was wonderful, cheeky and roguish keeping the young talented cast on track. Daniel Behle's performance grew gently into something magical as the evening wore on. I was enthralled for the whole 3 hours, I'm so glad I didn't listen to some of the poor reviews it received. Apart from anything else it was beautifully acted, I loved it! Disappointing evening, the production made little sense and putting a moustache on the men hardly changed them sufficient that the two ladies would not be able to recognise their finances. Why change the time period I. Which it was set given that ladies in the present would hardly swoon and have the vapours if their men were called up into the services. The singing although good, was too strident and reminded me of modern TV comedy where everyone has to shout to be heard. Such good voices need to e moderated not encouraged to to go full blast. Unfortunately, if I was asked to grade this performance it would be 1*or 2* at best. Having seen this opera several times it did not come up to scratch in comparison to those performances. Splendid singing, beautiful music (of course!) but what an ugly lousy costumes and decor! Also the director could make a far better job! Disastrous! The light was sometimes out of balance. The Nationale Opera in Amsterdam does a far better job!!! They performed (with director Pierre Audi) some breaking interpretations of the Golden Oldies. They're the BEST!!! Despite these criticisms, we enjoyed the live performance of this Mozart Masterpiece in the Cinema round the corner!!!! Somewhat confused by so many negative comments. Sometimes you need to stand back and review the new production on what is in front of you and not looking back all the time. The production was fresh and packed with intrigue. Well done, a shame it was a live screening and I wasn't around the ROH in person. I really enjoyed this production, seen as a live screening in my local cinema at Penrith, Cumbria. The humanity inherent in both the music and da Ponte's words came over very clearly and the trauma and anquish suffered by the girls particularly, was very strong. What a load of pretentious comment!, this was an excellent production of what is a very silly opera - do some of the correspondents not know what buffa means. Well sung by all 6 principals (Despina was fantastic). Antics during the overture were ridiculous however and ending left a lot to be desired. Like other Mozart operas it is too long! Have always enjoyed Cosi until your updated and ridiculous sets. Instead of being able to enjoy the beautiful singing, I was sitting in my seat wondering WHY you ruined it with stupid scene like the above photo with long table. Suggest set designers create their own operas and leave the perfect classical productions alone for audience members to continue to enjoy.